A recent study by Transparency Market Research (TMR) has detected that the global effervescent packaging market is heavily dependent on product innovation and in the near future, a number of strategic mergers and acquisitions will follow that will define the leader. Some of the key companies currently operating in the global effervescent packaging market are Sanner GmbH, Oracle Packaging, Inc., Unither Pharmaceuticals, Romaco Pharmatechnik GmbH, Parekhplast India Ltd., Tower Laboratories Ltd., Nutrilo GmbH, Hebei XINFUDA Plastic Products Co., Ltd., and Amerilab Technologies, Inc. The TMR report projects the demand in the global effervescent packaging market to increment at a strong CAGR of 7.9% during the forecast period of 2017 to 2027, reaching a valuation of US$711.4 mn by the end of 2027, remarkably up from its evaluated worth of US$311.8 mn in 2016. Capacity expansion, production expansion via acquisition, customized offerings, and geographical outreach are some of the common strategies of the market leaders. For instance, Romaco Pharmatechnik GmbH is focused on showcasing their new products in exhibitions and events as a key marketing strategy, whereas Unither Pharmaceuticals is dedicated towards geographical expansion to mark its footprint in China, establishing Unither Pharmaceuticals Technologies (Wuhan) Co. Ltd. in 2016. In May 2017, Sanner acquired plastina Holding AG, the parent company of Jaco S.A., following the launch of new packaging solution for effervescent tablets called as Brilliance, with a featured ability to protect tablets from humidity and moisture. Based on primary packaging, the report segments the global effervescent packaging market into blisters, bottles, tubes, sachets, and stick packs. In 2017, tubes segment accounted for nearly the half (49.7%) of the demand, and is projected to maintain the same demand percentage until 2027, whereas blisters is the only segment with positive growth rate. Tubes is estimated to be a significantly lucrative segment of the effervescent packaging market due to the non-toxic and customer-friendly packaging. On the basis of secondary packaging, the report observes that paperboard cartoons have the exponentially more demand than side sealed bags and wallet packs. Tablets are most profitable product, while plastic serves most of the demand in terms of material type. Geographically, Europe is the most profitable region, accounting for 39.4% of the global demand and exhibiting a CAGR of 8.0% during the forecast period of 2017 to 2027. On the other hand, North America is anticipated to increment the demand at the best growth rate among all regions including Europe, Asia Pacific, Latin America, and the Middle East and Africa. The prosperity of the global effervescent packaging market is dependent on a number of factors, such as growing popularity of fast dissolving drug delivery systems, rising consumer interest in preventive health, rise in e-commerce that has eased the availability for the consumers, increasing disposable income, and flourishing healthcare sector. The ability of effervescent products to incorporate a large variety of active ingredients in a single dosage form offers numerous advantages over conventional tablets. On the other hand, regulatory issues, lack of financial capability of regional players, and low penetration in emerging economies are some of the challenges hindering the effervescent packaging market from attaining its true potential. 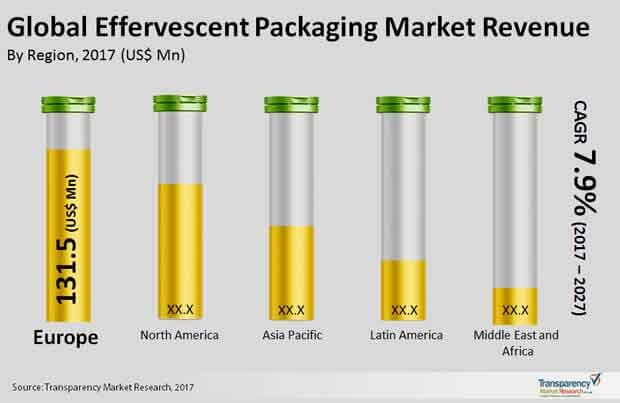 Some of the key trends noted by the report for effervescent packaging market are: portfolio expansion and rising preference of tubes over sachets, whereas the use of high barrier material for blister packaging is expected to create new opportunities for the participants of the global effervescent packaging market.